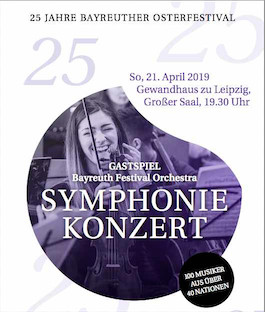 The Internationale Junge Orchesterakademie is looking forward to a versatile 25th Easter Festival. This year, there are varied concerts from the fields of classical music, chamber and organ music as well as jazz and salon concerts. This year, the international orchestra presents the musical results of its one-week rehearsal phase with Anton Bruckner's 4th Symphony and Wagner's Tristan and Isolde, and the Wesendonck songs, under the guidance of renowned professors. As conductor Matthias Foremny could be won. As usual, the concert donations and the proceeds from the CD sale will support children with cancer and seriously ill children.